Our best wipe for absorbing grease and oil-based liquids. 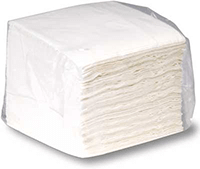 Made of highly absorbent cellulose which is bonded for added strength. More economical than rags for wiping down tools and equipment. Polybagged packs of 50 wipes each. Sold in cases of 900. Check out our other wipes!